There’s nothing like a pair of jeans that just fits in all the right places. If you’ve been following me the blog or through IG, then you know I reallyyyy loveeeeeee a good pair of jeans. It’s the one thing I can never say no to- especially if they fit perfectly. This was the case with these jeans. I’ve been wanting a pair of mom jeans ever since the trend came out and I looked everywhere but nothing really fit right. I’m 5’3″ and weigh less than a 100 lbs so you can definitely say that I’m on the petite side. All the jeans were either too wide in the hips or thighs or fit in the legs but then too big at the waist. Now, lets talk about this shirt…I’m all about anything that is off-the-shoulder, but who isn’t? I picked up this blouse by luck in Forever21 (because lets be real, its impossible to find anything cute in store- its much easier online) and had to buy it because it was only $20. I loved the boyfriendy button up look it has and the contrasting collar really won me over. I paired it with my jeans because I love how both pieces had contrasting details and an off duty look. 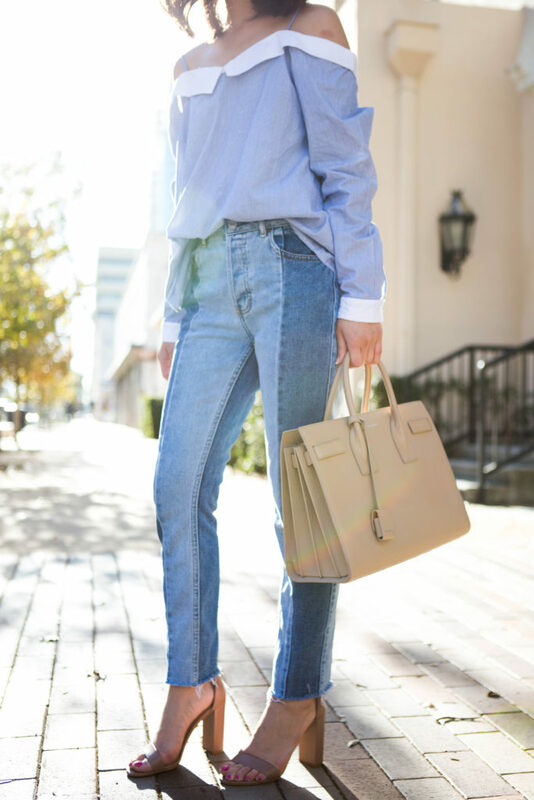 Check below for my other fav off shoulder button up tops and mom jeans! Shop my fav pieces below!